David Hirson’s costume drama “La Bête,” which played briefly on Broadway in 1991, has been revived primarily as a vehicle for Mark Rylance, the supernaturally energetic comic actor who won the Tony Award two years ago for his deadpan slapstick turn in “Boeing Boeing.” Here Rylance gets to play Valere, an outrageously self-regarding buffoon whose street performance has charmed the Princess (Joanna Lumley of “AbFab” renown), who now wants him installed in her royal theater company headed by the lofty resident playwright Elomire (David Hyde Pierce). And Rylance delivers spectacularly. Not many actors could pull off a 25-minute monologue – in rhymed couplets, no less! – of nonstop babble, commentary, self-amusement, and bombastic attempts at poetic invention, all the while spewing food, belching, farting, and even dropping his pantaloons to use the chamber pot without pause for breath or dignity. “Shut up, shut up, give someone else a chance!” he cries with stunning imperviousness. “I’ve been told such things all over France!” And he makes the character riveting, as hilarious as he is revolting. 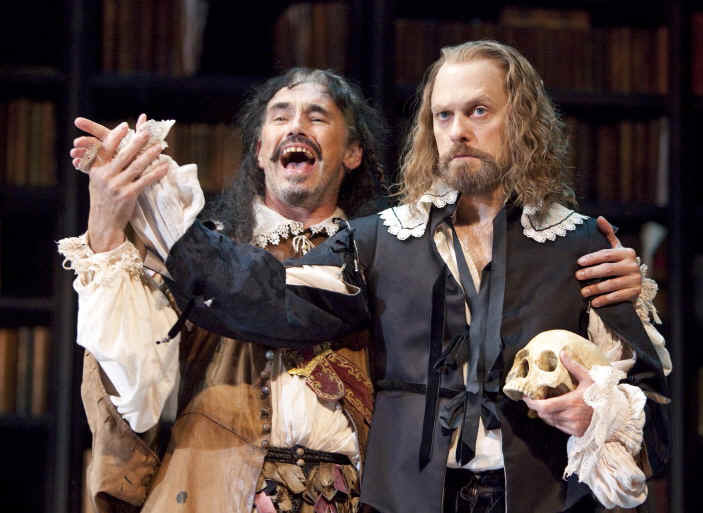 The play is set in 1654 France, so we are naturally meant to understand Elomire as a stand-in for Moliere, and you could say that the play revolves around an age-old competition between high art and low art for the heart of the citizenry. Or a denunciation of mediocrity over virtue, or an attempt to discern the distinction between education and elitism, between elitism and snobbism, between leadership and entitlement. But that might make it sound dry and predictable. Especially in Matthew Warchus’s energetic, physically beautiful, and carefully detailed production, “La Bête” remains surprising and provocative throughout most of its intermissionless hour and 45 minutes. Underneath its entertaining shenanigans, which include the elaborate impromptu staging at the Princess’s request of Valere’s “Parable of Two Boys from Cadiz” (something about twins named Esteban and a wooden leg), “La Bête” directly reflects on the state of American culture. Chalk it up to my perhaps excessive desire to find contemporary relevance in whatever theater I see, but I found myself relating Valere to Fox News, the 24/7 generator of sensationalized, ideologically slanted tabloid gossip that has managed to convince a big chunk of Americans that its output constitutes legitimate news reporting. And I viewed Elomire as an allegorical representative of the liberal-left, so accustomed to considering itself the Correct Way to Think that it can only greet fulminations from right-wing demagogues with outrage and dismissal rather than making a persuasive case for its own side. How else to explain George W. Bush getting enough votes that the Supreme Court could give him the presidency over Al Gore, or enough Americans supporting him to get re-elected? How else to explain the Obama administration’s refusal to engage meaningfully in the culture wars afoot with the ascendancy of the Tea Party? I’m not saying this is the only way to view the play, or American politics. But when the actors in Elomire’s company get drafted into performing Valere’s pageant, they wind up saying, “It wasn’t the disgrace we expected. It was lively, accessible, fun.” Are they being dumbed down, or are they responding in a human way with relief at departing from Elomire’s ivory-tower picture of the world? Hirson stacks the deck in “La Bête,” making Valere not just foolish but in some fumbling way self-aware and therefore endearing. (Unlike, say, Fox News, which is cynical and manipulative.) Meanwhile, Elomire never really mounts a case for the value of his own work and worldview, allowing his company members to distance themselves from him by saying, “Who cares about the bloated state of language and its ethical dimension?” Is there really nothing in between? The play ends with Valere elevated to glory and Elomire banished from the palace, heading off into the darkness, alone and miserable. Is the playwright saying this is the way of the world, that Saran Palin will always prevail over Al Gore? Is he saying that SHOULD be the way of the world? Or is he being devilish and provocative in the Brechtian manner of saying to the audience, “If you think this is wrong, argue with me”? Whether it’s a political fable or not, “La Bête” is a fine evening of theater. Mark Thompson’s extremely theatrical sets and costumes are a big plus. I felt sorry for Greta Lee, the actress who plays Dorine, a housemaid who speaks only in cryptic monosyllables that rhyme with “blue,” forcing everyone else to play charades to figure out what she means. Maybe there’s some political significance there, too, but the motif provides more tedium than comic relief. In a good supporting cast, Stephen Ouimette is especially good as Elomire’s assistant, Bejart. David Hyde Pierce has much less to do, and less fun, than Mark Rylance, but he doesn’t disappear into the shadows in the slightest, and that takes an actor with strong presence. Joanna Lumley is no slouch, either, quite perfect as the Princess who alternates between imperial graciousness and temper tantrums. This is her first appearance onstage in New York, and I might note that she gets the single most fabulous entrance on Broadway this season.